Mr. Stephen Hughes, CEO, commented: "Having worked in Nova Scotia early in my career, I have always known the province is rich in gold. Atlantic Gold are proving that by operating the Touquoy Gold Mine and rated the lowest cost gold producer in the sector (All-in sustaining costs USD 566 per oz.). Atlantic recently announced total in-pit Measured and Indicated Mineral Resources for the Moose River Consolidated Mine topping 2 million ounces, confirming potential for large scale gold projects in the province. Carube staked the SBG project area because it shows significant exploration potential for saddle-reef and vein hosted gold mineralization. 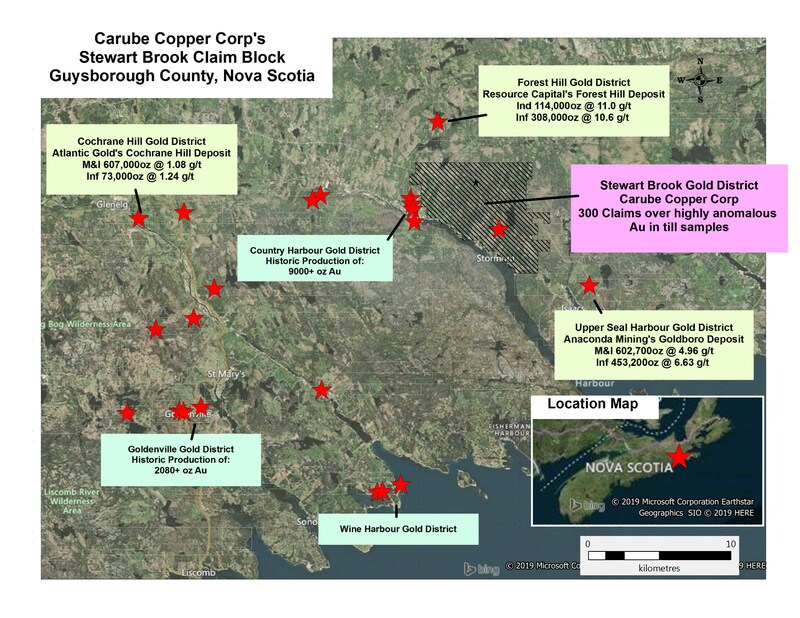 The large gold in till anomaly has never been followed up and the underlying Goldenville Formation is host to most of the gold produced historically in Nova Scotia. The Company is planning immediate boots-on-the-ground mapping and sampling in order to determine the source of the strong gold in till anomaly. Securing a prospective gold district in a favorable jurisdiction is just another step in positioning Carube for near term growth and creating long-term value for all stakeholders." Gold mining in Nova Scotia's dates back more than 150 years, commencing in the mid 1800's and continuing through to the early 1900's. It is estimated that over a million ounces of gold has been produced during that time, and the province is once again seeing a boom in mineral exploration and mining. Although not as well known as the Yukon gold rush, more than 60 gold districts were established in the province. Forest Hills Gold District is located 6km north of SBG and records indicate more than 26,000 ounces was produced. The Forest Hills deposit is owned and operated by Resource Capital Gold Corp, who have defined an uncapped Indicated resource of 114,000 ounces gold grading 11.0 g/t Au and an Inferred resource of 308,000 ounces gold grading 10.6 g/t Au)(1). Anaconda Mining's Goldboro deposit is located in the Upper Seal Harbour Gold District and 6.5km southeast of SBG, records indicate more than 57,000 ounces was produced. Anaconda recently announced PEA study results for the Goldboro deposit, indicating a 9-year mine life with gold production estimated at 375,900 ounces and an all-in sustaining cash(AISC) cost of $797 per ounce (~USD$615* per ounce)(2). Country Harbour Gold District is located 5km west of SBG and historical records indicate more than 9,000 ounces was mined(3). Atlantic Gold's Cochrane Hill open pit resource is located approximately 20km west of Carube Copper's SBG has a Measured and Indicated resource of 607,000 ounces of gold at 1.08 g/t and an inferred resource of 73,000 ounces of gold at 1.24 g/t (4). The close proximity of current gold resources and past gold production does not necessarily mean the same would be found on Carube Copper's SBG project area. (1) Forest Hill resource data from RCG website project summary http://www.rcgcorp.ca/projects/forest-hill. (2) Goldboro reserve and AISC numbers from Anaconda Mining website https://www.anacondamining.com/goldboro-project. (3) Country Harbour Historic production from Nova Scotia publication OFM ME 1986-055. (4) Cochrane Hill resource from Atlantic Gold's website http://atlanticgoldcorporation.com/projects/cochrane_hill_project/. Seabright Resources Inc. conducted an extensive till and soil geochemical survey over the Meguma Terrane in Nova Scotia between 1986-1989. 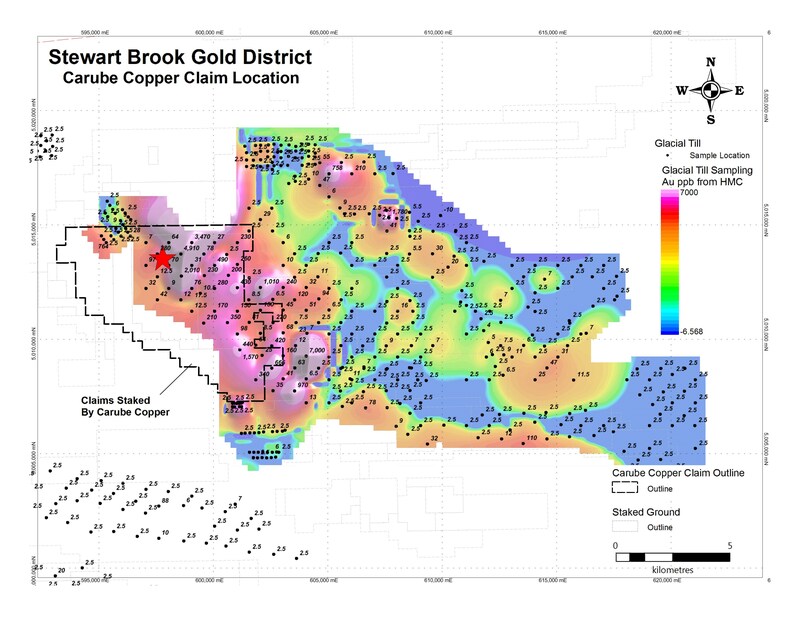 Seabright's comprehensive sampling program identified numerous gold in till anomalies across the province, including an 8,000m by 4,000m anomaly at SBG. A total 48 tills were taken, collected at 1000-metre spacings along 500-metre spaced grid lines. A heavy mineral concentrate was prepared from each till sample and analyzed for gold and 25 elements. In total more than sixty percent of the samples assayed above 0.07g/t gold, and up to 4.9g/t, and the anomaly is open in all directions. Anticline and syncline structures have been mapped in the project area, and a large northwest structure bisects the project area. The exploration target is a classic saddle-reef deposit within anticlinal structures, associated cross cutting auriferous veins and disseminated or fractured controlled gold mineralization. Carube is excited about securing the Stewart Brook gold project, and exploration activities are expected to commence soon. This is another step in the Company's corporate strategy to secure exploration projects with compelling targets that are at or close to drilling stage. Carube continues to look at options on how to optimize value of the current asset base in Jamaica and is engaged in discussions with interested potential strategic partners. Senior management continue to evaluate exploration properties, focusing on mining-friendly jurisdictions with transparent permitting and well-established infrastructure. Carube Copper is focused on creating substantive long-term value for its shareholders through the discovery and development of world class copper and gold deposits. Carube currently holds a 100% interest in 11 licenses covering 535 km2 of highly prospective copper-gold terrain in Jamaica, and a 100% interest in three porphyry copper-gold properties covering 492 km2 within the Cascade Magmatic Arc in southwestern British Columbia. Carube is actively searching for additional high potential copper and gold properties to add to its portfolio. QP Statement: This press release has been reviewed and approved by Mr. Shannon Baird, P.Geo., Carube Copper's Exploration Manager, in his capacity as a qualified person as defined under NI 43-101. This news release includes certain "forward-looking statements" which are not comprised of historical facts. Forward-looking statements are based on assumptions and address future events and conditions, and by their very nature involve inherent risks and uncertainties. Although these statements are based on currently available information, Carube Copper Corp. provides no assurance that actual results will meet management's expectations. Factors which cause results to differ materially are set out in the Company's documents filed on SEDAR. Undue reliance should not be placed on "forward looking statements".